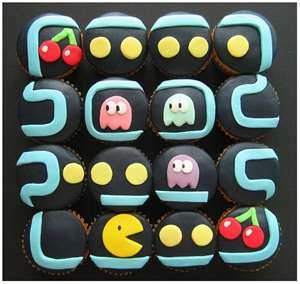 1970 birthday party ideas for kids, tweens - celebrate a birthday with a blast from the past! 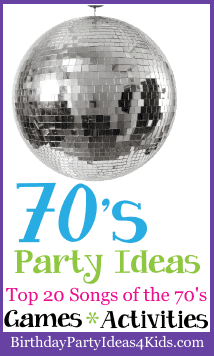 We've included 1970 theme ideas for 70's theme party invitations, decorations, activities, party games, food, favors, goody bags and more. Also includes the top 20 song play list from the 1970's to use at your party. corded phones, record players, disco balls, tye dye, flowers etc. Invitations with large smiley faces. Have a best style contest - tell party guests to dress in their best 70's style items including: Bell bottom jeans, silk shirts, mini skirts, go-go boots, anything with fringe, headbands, tye dye, platform shoes, disco dresses, etc. Hang small disco mirror balls outside in the trees. Shine a few flashlights on them to make them sparkle. Cut out dance footprints from poster board and tape them down to the sidewalk and party entrance. Make signs that have the names of the popular dances like the Bump, The Hustle, etc. and place them outside with the dance footprints. Hang a beaded curtain that party guests will have to enter through at the party entrance. You could also make a sign in bright colors that says "70's Ahead!" or "Time Travel - destination the 1970's ". Inside the party room hang a large disco ball. Decorate in bright tye dye or solid colors. Set out lava lamps, black lights, beaded curtains, bean bags and shag rugs. Cut out large circles from black construction paper and then smaller circles of different colored paper and glue the smaller circle in the middle of the larger circle to make records. Print 1970's song titles and artists inside the smaller circle and hang on the walls. You could also make these as place mats for the party table. Play the favorite songs from the 70's. Pet rocks were big in the 1970's. They were basically a medium size smooth rock that came in a small wooden crate filled with straw. You could teach your pet rock tricks like sit, stay and play dead. Dancing was a big part of the 1970's. Teach the party guests some of the most popular dances from the 70's. (If you don't know the dances look them up on YouTube). Some popular dances from the 70's are the: Hustle, Bump, Disco, Funky Chicken and YMCA. You can also let them listen to some of the silly songs such as Kung Fu Fighting, The Streak and Convoy. Let the party guests decorate a t-shirt using permanent markers or highlighters (they show up great under black lights) with slang phrases from the 70's. Can you dig it?, Don't be such a spaz, Dream On, In your face!, Chill, Get down, Boogie, Keep on truckin', To the max, Jive talkin', Boo Ya, Smokin', Dig it, Drag, Far out, Foxy, Funky, Groovy, Hip, Jive Turkey, Out of Sight, Peach, Radical, Stoked, Totally Awesome. These sayings would be great on signs hung around the party room also. We made these all the time at parties in the 70's. Easy instructions for the bead pattern can be found here on our website: Magazine roll up necklaces. Set up a Karaoke area and let the party guests sing to some 1970's songs. Set up stations where guests can make Shrinky Dinks, String Art or Gum Wrapper necklaces.